You will need to find reputable dachshund breeders, once you have decided a dachshund is the right dog for you. They are breeders who have invested the time and commitment to the breed so ensuring that your puppy is well breed. To help you out with your search we have put together a breeders directory, at the moment these are only American breeders but we are inviting breeders from other countries to list with us. 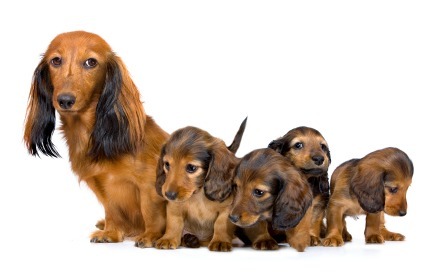 Many dachshund breeders keep their number of dogs small enough so they can keep them in their home sometimes with an extension but still in the home so they are socialized in a home environment right from the start. Slighter larger operations usually have a separate accommodation for their dachshunds but give the dogs’ access to the home environment and raise the puppies in the home. The breeder will ask you almost as many questions about you as you will about them as they want their puppies to go to good homes with people who appreciate the special delights of a dachshund dog. The main thing that sets these breeders apart is the fact that they love their dachshunds and they are dedicated to improving the genetic quality of the breed. Many breeders show their dogs at Confirmation shows local and National Breed where competition can be keen. This offers breeders a good opportunity to see other dachshunds and how the breed is developing and meet interested breeders. Some breeders are also interested in the dog agility events and are keen competitors, this is another interesting side of owning a dachshund and these little dogs love to compete. When visiting the breeder and meeting the puppies take your time, make sure you are relaxed and have time to spend playing with the puppies and if possible interacting with the parents. Ask lots of questions most breeders are only too happy to answer all your quires as they want you to have a good understanding of the type of dachshund, smooth haired, long haired or wire haired you are interested in. Where do the puppies live, in the breeders home or in kennels. How are the puppies socialized with people and other dogs. Type of food given to the dogs – high quality, natural. Does the breeder carry out any early puppy training. What guarantees are offered on purchasing a puppy. Do they have references available from other families who have purchased puppies. Is there at least one of the puppy’s parents available for you, to check on looks, temperament and physically soundness? What is the dachshund breeder’s policy if for any reason you cannot keep the puppy? Many problems or issues with dachshunds can be traced back to their breeding like genetic faults, health issues and temperament problems. Reputable breeders put a lot of thought and money into their breeding program ensuring their breeding stock are free of genetic disorders and have excellent temperament. Tests should include certification from Orthopaedic Foundation for Animals (OFA) on hips, knees and elbows, Canine Eye Registry Foundation (CERF ) clearance and the history of spinal x-rays on both parents. Dachshund club of America web-site maintains a list of member breeders who agree to abide by the their code of ethics, this code specifically prohibits breeders from selling puppies to pet stores so you will not find a puppy bred by a responsible breeder in a store. Most breeders are members of the American Kennel Club (AKC), this organisation plays a major role in the pedigree dog breeders world of America. They assist breeders with resources, pedigree dog registration and educational programs. Breeders register their litters with the AKC which holds the records. The AKC carries out kennel inspections to check on facilities provided by breeders and that record keeping is correct, also this organisation operates a DNA centre. It is the American Kennel Club that is involved in National Dog Shows and organises an Event Calender - which gives information about both club and National Confirmation Dog Shows and Obedience and Agility events.